Spielberg makes use of the widescreen frame to set the airport atmosphere, so don't bother with the full-screen VHS. A weightlessly bittersweet Steven Spielberg bonbon, "The Terminal" plays like the first few episodes of an expensive, gimmicky sitcom about a guy forced to live in an airport. 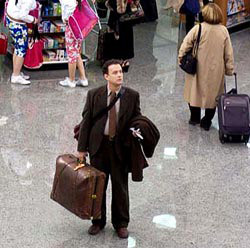 Tom Hanks is Viktor, an East European tourist left in travel-visa limbo when his fictional country of Krakozhia undergoes a coup and suspends all its passports while he's in flight to New York. When he lands at JFK, cursory attempts to explain the situation are offered by the airport's terse, procedure-wonk Homeland Security chief (Stanley Tucci) -- but only in English, which Viktor barely understands. Then he's left to his own devices but told he cannot leave the international terminal. So he sleeps on benches in an under-construction passenger gate and lives off fast food he buys with quarters collected by returning abandoned rented baggage carts to their vending-machine dispenser. Over weeks and months he learns English by reading tourists guides and comparing them to his own. And, of course, he has largely compartmentalized little adventures. There's the episode in which Viktor helps a baggage guy (Diego Luna, "Y Tu Mamá, También") woo a pretty immigration clerk (Zoe Saldana, "Center Stage"). There's the episode in which he gets an under-the-table job with a construction crew working on the new gates where he's been crashing at night. There's the reoccurring character of the pretty, romantically mixed-up flight attendant (Catherine Zeta-Jones) whom Viktor awkwardly courts. And running through all the episodes is the semi-villainous Tucci, who seems hell-bent, for no apparent reason other than providing dramatic conflict, on not letting Viktor get the proper paperwork to leave the airport and go into New York City. Each of these (and several other) episodes have their smile-inducing or effectively tender moments (even if they're over-scripted and accompanied by composer John Williams' too-twinkly score), and Hanks wears both his character's initial naiveté and his emerging savvy endearingly well. But Spielberg tries way too hard to conjure up Magic (with a capital "M") in these unsophisticated plot devices, and the practical upshot is that most of the movie feels patently staged, despite uniformly good performances. It takes place in a world of contrivances, where CNN plays Viktor's national anthem to announce every news story about Krakozhia (so he knows to come running toward the nearest airport-bar TV), where every character is a colorful eccentric (a paranoid janitor thinks Viktor is a spy for the Immigration and Naturalization Service), and where people actually utter lines like, "You're the kind of woman who could get any man she wants. Why Viktor Navorski?" It's a film with a clever subject matter shortchanged by over-simplicity and emotional shorthand. But it does have one terrific spark of life in Catherine Zeta-Jones, who, despite being drop-dead gorgeous, is entirely credible as a Midwestern everygal whose insecurities have her trapped in a self-perpetuating fly-by-night, seven-year affair with a married man. Mistaking Viktor for a businessman whom fate keeps dropping in her path every time she's at JFK, he becomes a potential catalyst for change in her life, and Zeta-Jones gives wonderful veracity to the stewardess's vulnerable discombobulation and growing self-determination. Better still, she's the one character in "The Terminal" whose story arc doesn't have an entirely predictable outcome. The picture's other better-than-sitcom saving grace is Spielberg's lively cinematic depiction of the chaotic hustle-bustle of airport life, seamlessly recreated in every minute detail on a massive soundstage the size of, well, an airport terminal. But "The Terminal" is surprisingly sloppy for Spielberg (we never see the baggage handler actually date the immigration clerk, but the next thing you know, they're having a cute airport-themed wedding) and the film's true pedestrian nature is very much personified in Tucci's red-tape-wound bureaucrat. He could have been more than just a symbolic, all-purpose obstacle for Viktor to run up against. But instead he's just a plot-expedient jerk who in their first meeting explains Viktor's predicament by grabbing a snack from his lunch and saying, "Imagine these potato chips are Krakozhia" -- then smashing the chips with his thermos. You can practically hear the pregnant pause where the sit-com laugh track would go, even though this action isn't funny -- it's cruel. That kind of every-scene-needs-a-joke writing from scripter Jeff Nathanson is the biggest disappointment of "The Terminal" -- especially since he and Spielberg had such a winning and sophisticated collaboration in 2002's "Catch Me If You Can."